Gangaur festival, also known as Gauri Tritiya is richly celebrated by the female folks of Rajasthan in India. This is a festival, which acknowledges love and marriage and is dedicated to Goddess Gauri, wife of Lord Shiva. Apart from Rajasthan, people residing in parts of Gujarat, West Bengal, Madhya Pradesh and Telangana, also observes Gangaur festival. It is devotedly celebrated for 18 days, and on the final day, a grand procession is conducted, where a giant statue of Goddess Gauri is decorated and taken through the city. It is enthralling to witness the festivity, with married women donned in bright colours, especially red and ethnic jewels. Gangaur Puja 2019 began from March 21, and the main Gauri Puja will take place on April 8. Here is the significance of Gauri Tritiya Vrat and puja vidhi of the auspicious Rajasthan festival. WhatsApp Stickers, GIF Images, Wishes, SMS to Send Happy Navaratri Greetings During Nine-Day Festival. Gangaur Puja also marks the celebration of monsoon and harvest. Gana signifies Lord Shiva, and Gangaur symbolises Lord Shiva and Goddess Parvati together. The festival is altogether a very colour affair, and it attracts a considerable number of tourists every year. Significance & Mythology Related to Celebration of Birth Anniversary of Matsya- Lord Vishnu’s First Incarnation. Gangaur festival immediately starts after the celebration of Holi. According to the Hindu lunisolar calendar, the festival commences on the first day of Chaitra and continues for 18 days. This year, Gangaur festival started from March 21 and Gauri Tritiya will end on April 8 with a great observation of the festivity. The Gauri Tritiya Tithi, as per Drik Panchang begins at 04:01 pm on April 7 and ends at 04:15 pm on April 8, 2019. Gangaur signifies, Lord Shiva and Parvati together. As per Hindu legends, Lord Shiva along with Goddess Parvati and Narad Muni, went out to take a small trip. When they reached a forest, the nearby villagers got to know about their arrival. All women were busy preparing a gorgeous spread for the Gods and Goddess. The lower class women came with their offerings; Shiva and Parvati happily ate the food. The Goddess showered blessings on them. History & Significance Behind the Celebration of Bengali New Year. Meanwhile, the women of the higher class too came with the food they had prepared for their beloved Gods and Goddess. After eating their meal, Lord Shiva asked his wife how she was going to bless them, to which she replied that she intended to bless them with her own blood. She scratched the tip of her finger and sprinkled the blood on these women. 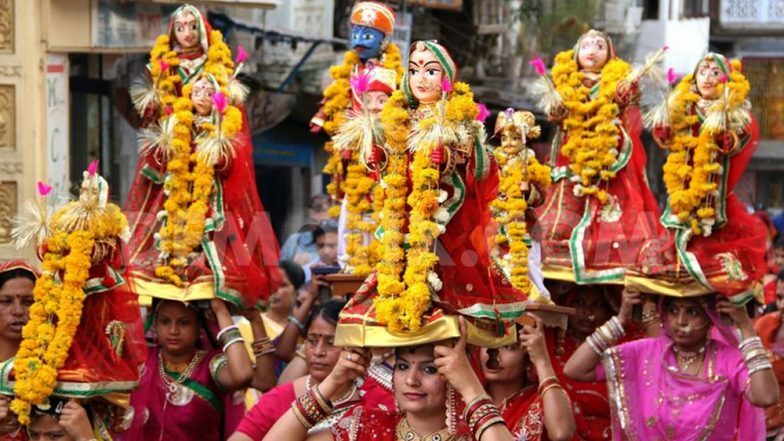 Gangaur festival is celebrated throughout Rajasthan with much fun and enthusiasm. However, the festivities are very grand in a few destinations like Jaisalmer, Udaipur, Jaipur, Jodhpur, Bikaner, Nathdwara and others. It is considered to be the best time to visit the state and witness the popular culture of the community. Idols of Lord Shiva and Goddess Parvati are purchased from local artisans. They are decorated as pleased and placed in a basket, decorated with flowers and grass. Newly married women fast for the whole day (18 days) for the long life of their husband. Unmarried women fast too, but they can eat one meal a day. On the 18th day of Gangaur Festival, a grand celebration takes place. Women bring the water pots on their head to the river bank. The earthen pots are broken near the river and idols are eventually immersed into the water.